Jecc’s heavy duty rotary screens also known as “trommels” are designed for heavy duty operations while being low maintenance and lasting longer. The rotary screens come in single or double action with a wide variety of screen mesh sizes. The constant tumbling action stirs up material over and over and keeps it in contact with the rotating screen longer so material slips through faster and easily. Ideal for these applications and more: Tires, C&D, E-waste, glass and plastics. 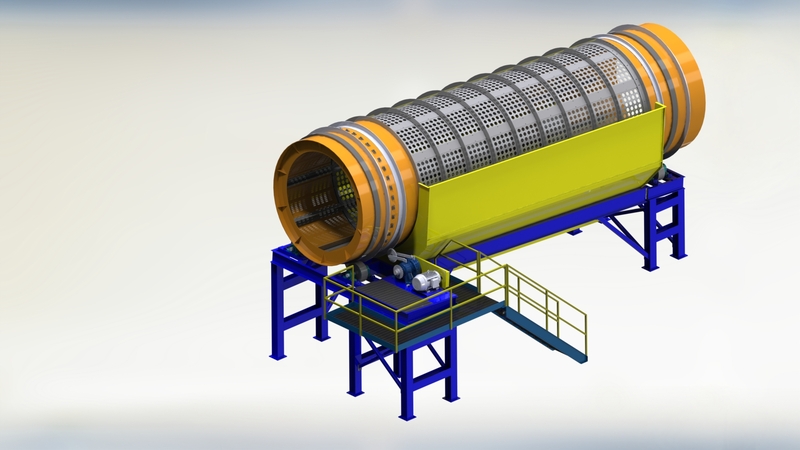 Jecc will design and manufacture a high performance rotary screen based on your application requirements. Mechanical screening is an efficient and profitable method of sorting diverse fractions within an aggregate. Our team of professionals has the experience and practical understanding of the screening technologies available. We can offer you a custom-made solution based on the properties of the aggregate to be screened and the desired end result. Jecc will select the best screening technology or will combine the best technologies to achieve your goal in the most efficient and profitable way. Jecc can also integrate these technologies into your overall system. Durable equipment for a greener future !